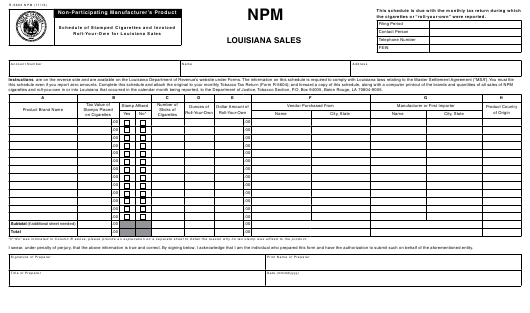 Form R-5602 NPM is a Louisiana Department of Revenue form also known as the "Non-participating Manufacturer's Product - Schedule Of Stamped Cigarettes And Invoiced Roll-your-own For Louisiana Sales". The latest edition of the form was released in November 1, 2013 and is available for digital filing. Download an up-to-date fillable Form R-5602 NPM in PDF-format down below or look it up on the Louisiana Department of Revenue Forms website.